For the past three quarters of a century the Fort Harrison has ruled as the city’s most recognizable landmark and center for its social life. Since establishing its international religious retreat there in 1975, the Church of Scientology has continually preserved and enhanced the building’s historic look and homey ambience, and has opened its doors for daily tours and service to the public in recent years. Born in the late 20’s, after the mass production of the automobile and subsequent emphasis on developing interstate roadways made travel affordable for all classes, the Fort Harrison heralded a new era of expansion. Built in 1927, the same year as the “million dollar causeway,” the then-new hotel not only brought a metropolitan air to the town, but also throngs of visitors. Though downtown Clearwater’s economy has ebbed and flowed over the years, along with the rest of the United States, upgrades of the Fort Harrison proved, each time, to create and re-create new vitality for the area. 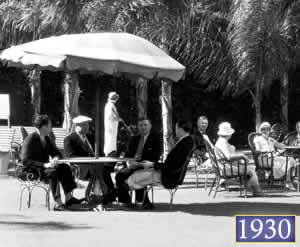 Guests in 1927 could avail themselves of amenities such as Turkish Baths, a beauty parlor, barbershop and a flower shop. Visitors enamored by the Springtime City could contact the real estate broker who had set up shop on the ground floor of the hotel to buy their own piece of Clearwater. Visitors whose health concerns brought them to the area had their prescriptions filled at the hotel’s own drug store. 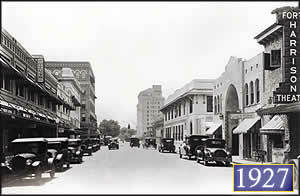 During the later years when the hotel was owned, first by R.E. 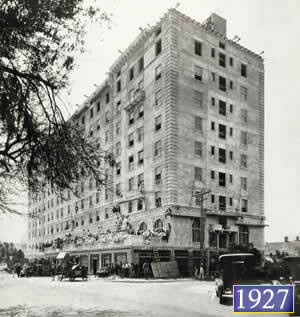 Olds (Oldsmobile inventor and founder of Oldsmar) and then by the Jack Tar Corporation, the hotel’s amenities changed to fit the needs of a growing tourist and resident population. More than one visitor to the Fort Harrison has told Freedom that they distinctly recall coming to the hotel with their mothers. While mom kept her weekly appointment with her hairstylist (who was located at the Fort Harrison), junior was kept busy eating grilled hot dogs by the pool. Now, 77 years after the hotel welcomed her first guests, the current owner, the Church of Scientology, is set to embark upon an ambitious renovation and restoration project; the result will be an upgrade of the facility, bringing it to a level rivaling any five-star hotel in the world. The Fort Harrison heralded a new era of expansion for Clearwater when it opened its doors in 1927, bringing a metropolitan air to the town -- today it continues that role of vitalizing the area. “This renovation will provide greatly expanded hotel accommodations, and this will bring a new wave of visitors to downtown, who will frequent shops and buy souvenirs from local attractions,” says Greg Gorgone, the Fort Harrison’s Property Manager. He points to a 2000 Economic Impact study done by Micro Economics Ltd., which stated that visitors to the Church of Scientology in Clearwater contribute better than $29 million to the local economy over and above what they spend at the Church’s hotels each year. Many Scientologists, like any who take on historic preservation projects, will most likely tell you, in so many words, what “a true labor of love” such endeavors can be. Part of the allure is the challenges that one inevitably encounters along the way. And so, from those connected to such projects as the Clearwater Library's new construction, the Fort Harrison renovations soon underway, and countless others throughout the Tampa Bay area, you will hear, as well, of the trials and tribulations, such as non-standard construction pre-dating building codes and planning departments, historic buildings with non-standard sized windows, leaning supports, or the worst of all, antique plumbing systems. Yet those immersed in restoring and preserving history say that, when all is said and done, the effort involved is more than worth it. More than 123,000 jobs were generated in Florida from historic preservation projects. More than $657 million in state and local taxes were generated from spending on historic preservation activities. More than $3.7 billion was spent in Florida by tourists who visited historic sites. This breaks down further into: 107,607 jobs, $2.3 billion in income, $4.5 billion in gross state product and $1.09 billion in taxes (including $583 million in state and local taxes). Source: Report: “Economic Impacts of Historic Preservation in Florida," Florida Department of State. Already, the plumbing and electrical systems of the building are being brought up to the most modern of systems, according to Gorgone. Central air conditioning will be installed for all of the floors, rendering the current window units obsolete. In the early spring, scaffolding will begin to go up around the hotel. While teams of construction and renovation staff work from the 11th floor penthouse on down through the building, the exterior will get its first face lift in 40 years — bringing back historical elements that have worn away over time, and adding new flourishes to compliment the pedestrian bridge that links the Fort Harrison to the new Flag Delivery Building. While the internal structure of the Fort Harrison will not dramatically change, says Gorgone, he points to several key internal projects of interest. These include the renovation of the Crystal Ballroom, a new Grand Staircase, and the renovation and return of 84 hotel rooms to their original use as guestrooms. The Hibiscus Restaurant, already known to many visitors and hotel guests for its fine dining, will also be renovated. Two additional restaurants, one on the south side of the front entrance (known to long-time residents as the site of the Gas Buggy Lounge) and one overlooking the gardens, will be added. 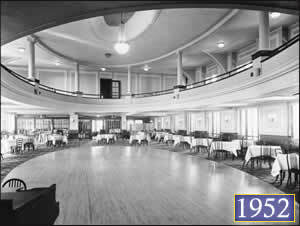 The restoration of the hotel’s community meeting rooms is also planned. By late 2004, the building’s completed renovations will be celebrated with an event that coincides with the opening of the new Flag Delivery Building across the street and the Church of Scientology’s 50th Anniversary.